Should you perform a 403b rollover to a Roth IRA? This is a question you should ask yourself when you leave your current employer. Because, when you leave employment, most 403b plans provide you with the option of rolling over (moving) your current 403b plan to another retirement savings plan, such as a Traditional IRA or a Roth IRA. Of course, if you're taking a job with another educational organization or non-profit offering a 403b plan of their own, you always reserve the right to roll over your old 403b plan into your new 403b plan. But wherever plan you ultimately choose, it's wise to spend some time to compare the benefits of a 403b vs. a Roth IRA to find out which plan is the best fit for your personal financial plan. The right choice won't be the same for everyone. But, if you decide that a 403b rollover to a Roth IRA is the best course of action, you need to know the rules for conversion. Prior to 2008, you could only roll funds over from a Traditional IRA, a SEP IRA, or a SIMPLE IRA to your Roth IRA. Because of the law change, your 403b is now eligible for a direct rollover distribution into your Roth IRA. So if you wanted to perform a 403b rollover to a Roth IRA prior to 2008, but couldn't... Now's your opportunity! 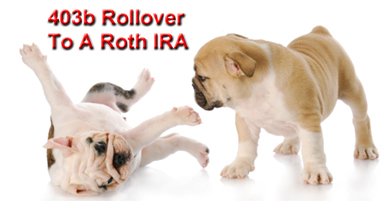 So what are the rules for a 403b rollover to a Roth IRA? Obviously, you need to have an open Roth IRA account to roll your 403b funds into. If you don't, make sure to open one prior to initiating the process. You also need to have adjustable gross income (AGI) of $100,000 or less in order to qualify for a Roth IRA rollover, although that limit soon changes, which we'll address in just a moment. Any rollover distribution you receive from your 403b must be moved into your Roth IRA within 60 days of the day you receive it. Otherwise, you owe taxes and penalties on the full amount of the distribution as if you had simply withdrawn it. And, of course, you'll probably owe taxes on some, if not all, of your rollover distribution. As of right now (2009), you can NOT perform a 403b rollover to a Roth IRA if your adjustable gross income (AGI) exceeds $100,000 for the taxable year. All that changes next year. As of 2010, the AGI limit on Roth IRA conversions disappears. As of 2010, you'll be able to roll over funds from your 403b, your Traditional IRA, your 401k, or any other qualified account regardless of how much money you make. So if you earn more than $100,000 today, don't get down about your inability to roll over funds. To perform a 403b rollover to a Roth IRA, all you need to do is contact your plan administrator and initiate the process. Details on how to do so should be available from your employer's accounting department. Pay special attention to the latter point. Depending on how you perform your rollover, things can get dicey if your 403b plan administrator withholds a portion of your funds for tax purposes. However, keep in mind that under the law, a written explanation of rollover treatment must be given to you by the plan making the rollover distribution. In this case, that's your 403b plan administrator. If you want to avoid having 20% of your rollover distribution withheld for taxes, contact your 403b plan administrator and ask them if they will transfer those funds through direct rollover into your Roth IRA. Not only does a direct rollover eliminate the mandatory 20% in tax withholding, but it simplies matters for you personally. Because without a direct rollover, you'll probably get a check. And that check needs to be deposited into your Roth IRA no later than 60 days after you receive it. Otherwise, you loose your opportunity to complete the rollover! So what sort of tax consequences do you trigger with a 403b rollover to a Roth IRA? You'll have to pay income taxes on any amount you roll over, unless of course, you made non-deductible contributions, such as with a Roth 403b (see below). But assuming you have a typical 403b plan, you're going to owe income taxes on the full amount of the rollover distribution, with the applicable tax rate being the same as what you would pay on your regular income. For tax purposes, you simply add the full amount of the rollover distribution to your adjustable gross income (AGI). But don't worry about your rollover pushing you into a higher tax bracket. The tax rate you pay is based on your pre-rollover AGI, not your post-rollover AGI. For instance, let's say you have a 403b with $225,000, an annual salary of $37,000, and you're in a 20% tax bracket. Even though you file a tax return with $262,000 in adjustable gross income, you remain in the 20% tax bracket. So your total tax liability is $52,400. If you were fortunate enough to have an employer who offered you a Roth 403b, and you were savvy enough to invest in one, then you can also choose to perform a Roth 403b rollover to a Roth IRA. You won't owe any taxes. Because the plan is essentially set up just like a Roth IRA. Your contributions are non-deductible, earnings grow tax free until retirement, and funds are withdrawn tax-free and penalty-free after age 59 ½. Since you've already paid taxes on the non-deductible contributions, you're free and clear to roll those funds over into your Roth IRA without additional taxes or penalties. There are many reasons you might want to perform a 403b rollover to a Roth IRA. But it's not always the best thing to do. Make sure you examine any potential rollover from every angle. Otherwise, you might trigger an unforeseen tax consequence or some other potential pitfall. And, remember, if you're currently ineligible for a 403b rollover to a Roth IRA due to the AGI limit, just wait patiently for 2010. Once 2010 arrives, the limit expires, making Roth IRA conversions available for everyone!